July flew by, August is almost gone, and we have been very busy at our Cape Cod Bed and Breakfast. One of my chores is to pick the wines to share with our guests; I work at this by helping pour wine at the weekly Wednesday wine tasting at the Belfry Bistro co-sponsored by my friends at Cellar 55 Wine Merchants. I literally work for wine and last week’s pay was outstanding in the form of Piña wine, a cult wine from Napa Valley, California. The tasting actually started with two French Rose’s from Chateau D’Esclans, which didn’t leave much of an impression. I have not had a lot of experience with Rose’ and am not qualified to judge, but personally I have had other less expensive Rose’ that were more memorable. The Rose’ was just a warm-up for the real star of the show, the Piña Napa Valley wines. Mary Tarpy from Andes Imports Company introduced the two wines we enjoyed. 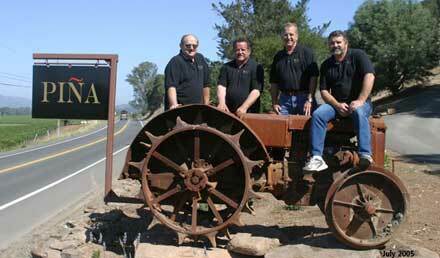 The Piña family history in Napa Valley is traced back to 1856 when their Spanish ancestors first farmed the land. Over the last century and half they have expanded from growing grapes for others, to the full service Piña Vineyard Management that controls the growth cycle for many of the most famous Napa Valley wineries. The current four Piña brothers, Larry, Davie, Ranndy, and John, have demonstrated their leadership as viticulturists and now have extended that expertise to their own small portfolio of single-vineyard wines from their own vineyards. The grapes for all Piña wines are from their five exceptional vineyards: the Buckeye Vineyard, the D’Adamo Vineyard, Firehouse Vineyard, the Ames Vineyard, and the Wolff Vineyard. Although they are famous for their single-vineyards wines, we started with the 2008 Cahoots, which is a blend from all five vineyards. The Piña label declares Cahoots "A secret collaboration of wines". In only its second year of release, the winemaker Anna Monticelli says "This balanced wine is very approachable and ready to drink now". Unlike their other Cabernets, this wine is crafted to drink younge. I am pleased to say I had already tasted the 2007 and now have tasted the 2008. Both are great, easy drinking wines. We closed with the single-vineyard 2007 Howell Mountain Buckeye Vineyards Cabernet Sauvignon pared with the Belfry’s signature Chocolate Delight desert. Dave from Cellar 55 describes it as a Cab-lovers Cabernet. I know I enjoyed it, especially with the wonderful chocolate. I enjoyed both wines, but at half the price the Cahoots has found a home in my cellar for those special occasions that beg for a great Napa Valley Cab. All Piña red wines are bottled in striking black bottles with gold etched text. As happy as I was to consume the contents, Nancy Simison, a fellow wine lover and local glass jewelry artesian, was just as happy to take home the empty bottles. She heats the bottles and gives them new life by creating beautifully etched and functional cheese trays. Nancy's art is available at the Collections Gallery on Jarvis Street in Sandwich, just up from the Belfry. I have one of her trays and enjoy recalling the first experience of the wine as I serve my guest from the tray, a gift that keeps on giving.